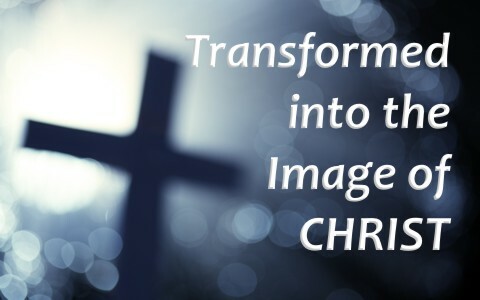 How can we be transformed into the image of Christ as we’re told to do? When God created the living creatures like the insects, birds of the air, and the beasts of the field, they were nothing like what He created in mankind. After God had created everything else, including all other life, “God said, ‘Let us make man in our image, after our likeness. And let them have dominion over the fish of the sea and over the birds of the heavens and over the livestock and over all the earth and over every creeping thing that creeps on the earth’” (Gen 1:26), “So God created man in his own image, in the image of God he created him; male and female he created them” (Gen 1:27). God didn’t create man after the ape kind but after his own kind and in the image of God He created them. He wanted man to be the image of God in heaven as mankind ruled over earth, but there was a problem; a real snake in the grass you might say. He would have much to do with how the image of God in us became marred by sin, and it would never be the same…at least until thousands of years later. It takes the Spirit of God and being in the Word of God to become more like the Living Word of God, Jesus Christ. After Adam and Eve chose to go their own way by rejecting God’s command to not take to eat of the Tree of the Knowledge of Good and Evil, their fellowship with God was severed. They still had a relationship, but even that wouldn’t be the same. When the serpent, the Devil, came to Eve, she told him that they could not eat of the Tree of the Knowledge of Good and Evil, so Satan said, “Did God actually say, ‘You shall not eat of any tree in the garden’” (Gen 3;10), casting doubt on God’s good word. Eve told him that God said, “You shall not eat of the fruit of the tree that is in the midst of the garden, neither shall you touch it, lest you die” (Gen 3:3), so now Eve added something that God never said. God never said they couldn’t touch it or they’d die, but if they ate of the fruit. See how Satan’s already twisted Scripture and now Eve’s fallen for it too? The result was “when the woman saw that the tree was good for food, and that it was a delight to the eyes, and that the tree was to be desired to make one wise, she took of its fruit and ate, and she also gave some to her husband who was with her, and he ate. Then the eyes of both were opened, and they knew that they were naked. And they sewed fig leaves together and made themselves loincloths” (Gen 3:6-7). The fall had come, and so “the Lord God said, “Behold, the man has become like one of us in knowing good and evil. Now, lest he reach out his hand and take also of the tree of life and eat, and live forever— therefore the Lord God sent him out from the garden of Eden to work the ground from which he was taken. He drove out the man, and at the east of the garden of Eden he placed the cherubim and a flaming sword that turned every way to guard the way to the tree of life” (Gen 3:22-24). The Apostle Paul writes that “For those whom he foreknew he also predestined to be conformed to the image of his Son, in order that he might be the firstborn among many brothers” (Rom 8:29), so that’s a worthy goal isn’t it? God has predestined us to be conformed or shaped into the image of Christ. Shouldn’t we desire to be more like Christ? That’s why I love to be called a “Christ-follower” rather than a Christian. Being a Christian is more of a label while being a Christ-follower is a believer’s job description. They walk with Christ and follow wherever He leads them, but first we need a transformation. For certain, we should “not be conformed to this world, but be transformed by the renewal of your mind, that by testing you may discern what is the will of God, what is good and acceptable and perfect” (Rom 12:2), but who does this transforming? It is not us. It is God’s Spirit that is shaping us, molding us, and forming us into the same image or likeness of Jesus Christ. Of course, we’ll not have the same glory that He has, but we should be living so much like Christ that if a person who had never met Christ saw you, they’d think it was Christ by the way you acted and the way you lived. We are admonished to “Have this mind among yourselves, which is yours in Christ Jesus, who, though he was in the form of God, did not count equality with God a thing to be grasped, but emptied himself, by taking the form of a servant, being born in the likeness of men” (Phil 2:5-7), and so “he humbled himself by becoming obedient to the point of death, even death on a cross” (Phil 2:8). If you are being transformed into the image of Christ, then you are becoming more like Christ and Christ humbled Himself to the point of death on a cross, so how can we not humble ourselves before Him? We need to have “this [same] mind among” ourselves. Don’t lose heart if the transformation doesn’t happen right away. I think for most of us, it’s not an overnight thing. It’s a lifelong process, much like sanctification is. That’s why “we do not lose heart. Though our outer self is wasting away, our inner self is being renewed day by day” (2nd Cor 4:16) by God’s Spirit. He is both working in us and through us, meaning we are active participants, meaning we must work out our own salvation with fear and trembling (Phil 2:12), so we’re not to just let God do it all for us. It is only God “who is able to keep you from stumbling and to present you blameless before the presence of his glory with great joy” (Jude 1:24), but we must strive to live a life of holiness and be blameless before God. That’s what it means to be transformed into the image of Christ. God’s Spirit works in us as we work out our own salvation, and day by day, we (should) become more like Christ. Being transformed into the image of Christ is easier if you are in the Word of God but it is not easy. We can’t abide in Christ if we’re not abiding in His Word (John 15:1-5), so even though it’s hard it’s certainly possible, but not by ourselves. It takes the Spirit of God and being in the Word of God to become more like the Living Word of God, Jesus Christ. Take a look at this related article: In What Ways are Christians Called to be Like Jesus? Good morning and thank you for allowing GOD to use you to help others and to spread HIS WORD. I found this article very interesting because “I ” have tried to transform myself in the image of CHRIST (LOL). It can’t be done in your own strength believe me I’ve tried only to fail time and time again. GOD is, GOD will and GOD does all this in HIS time not ours. My job is to stay in HIS WORD and allow HIM to transform me from the inside out!